Zoroastrian fire ceremony | Send an eCard! 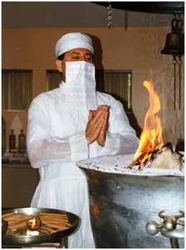 Zoroastrianism is a monotheistic religion of ancient Persia/Iran founded by prophet Zoroaster about 3,500 years ago. The principal belief is in the existence of a supreme deity, Ahura Mazda, and the cosmic struggle between a spirit of light/good and a spirit of dark/evil. Fire is a symbol of everything sacred.